I was first introduced to Debussy’s music when I was about 14 years old. I was performing some Chopin at a concert, and another pianist asked me to page turn for him. He played Clair De Lune and from then on I was hooked. I immediately learned it, then ploughed on through more of his repertoire including most of Children’s Corner, the Deux Arabesques, Rêverie and then studied the wonderful Images Oubliées while at University. I fell in love with the Danse sacrée et danse profane before I was even considering learning the harp, and also Prélude à l’après-midi d’un faune, which I studied for my final year project. Of course my interest in Debussy’s music lead me to discover Ravel and Fauré, and I’ve played many of their compositions too. Thankfully much of this beautiful piano music is possible to play on the harp. 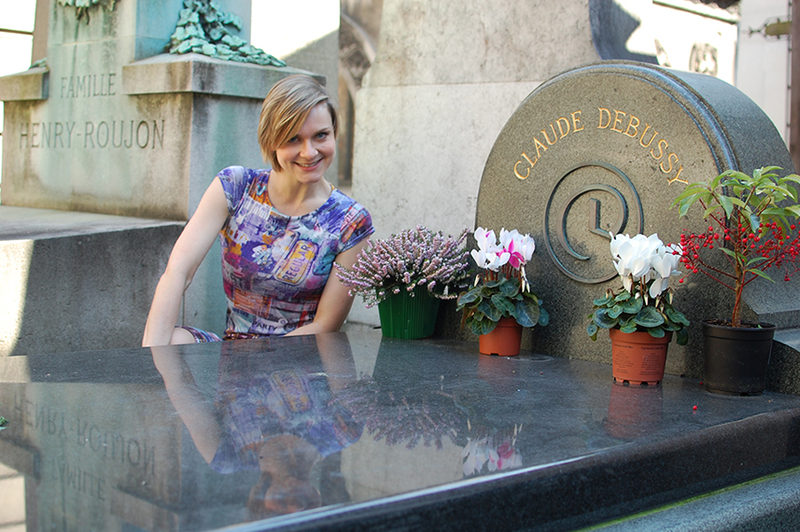 I’ve just got back from a weekend in Paris where of course I had to visit the Cimetière de Passy and pay my respects to both Debussy and Fauré! Unfortunately I didn’t get the chance to see any classical concerts, but my friends and I did go to see Bonobo at the Casino De Paris, which was an incredible show.